English economist, was born in 1766 at the Rookery, near Guildford, Surrey, a small estate owned by his father, Daniel Malthus, a gentleman of good family and independent fortune, of considerable culture, the friend and correspondent of Jean-Jacques Rousseau and one of his executors. 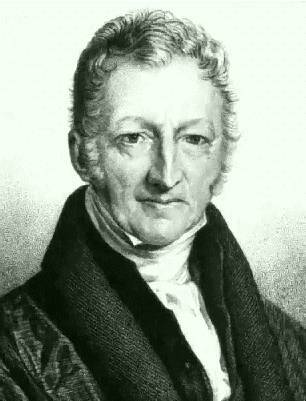 Young Malthus was never sent to a public school, but received his education from private tutors. In 1784 he was sent to Cambridge, where he was ninth wrangler, and became fellow of his college (Jesus) in 1797. The same year he received orders, and undertook the charge of a small parish in Surrey. In the following year he published the first edition of his great work, An Essay on the Principle of Population as it affects the Future Improvement of Society, with Remarks on the Speculations of Mr. Godwin, M. Condorcet, and other Writers. The work excited a good deal of surprise as well as attention; and with characteristic thoroughness and love of truth the author went abroad to collect materials for the verification and more exhaustive treatment of his views. As Britain was then at war with France, only the northern countries of Europe were quite open to his research at that time; but during the brief Peace of Amiens Malthus continued his investigations in France and Switzerland. The result of these labors appeared in the greatly enlarged and more mature edition of his work published in 1803. In 1805 Malthus married happily, and not long after was appointed professor of modern history and political economy in the East India Company's College at Haileybury. This post he retained till his death suddenly from heart disease on the 23rd of December 1834. Malthus was one of the most amiable, candid and cultured of men. In all his private relations he was not only without reproach, but distinguished for the beauty of his character. He bore popular abuse and misrepresentation without the slightest murmur or sourness of temper. The aim of his inquiries was to promote the happiness of mankind, which could be better accomplished by pointing out the real possibilities of progress than by indulging in vague dreams of perfectibility apart from the actual facts which condition human life. Malthus's Essay on Population grew out of some discussions which he had with his father respecting the perfectibility of society. His father shared the theories on that subject of Condorcet and Godwin; and his son combated them on the ground that the realization of a happy society will always be hindered by the miseries consequent on the tendency of population to increase faster than the means of subsistence. His father was struck by the weight and originality of his views, asked him to put them in writing, and then recommended the publication of the manuscript. It was in this way the Essay saw the light. Thus it will be seen that both historically and philosophically the doctrine of Malthus was a corrective reaction against the superficial optimism diffused by the school of Rousseau. It was the same optimism, with its easy methods of regenerating society and its fatal blindness to the real conditions that circumscribe human life, that was responsible for the wild theories of the French Revolution and many of its consequent excesses. The project of a formal and detailed treatise on population was an afterthought of Malthus. The essay in which he had studied a hypothetical future led him to examine the effects of the principle he had put forward on the past and present state of society; and he undertook an historical examination of these effects, and sought to draw such inferences in relation to the actual state of things as experience seemed to warrant. In its original form he had spoken of no checks to population but those which came under the head either of vice or of misery. In the 1803 edition he introduced the new element of the preventive check supplied by what he calls "moral restraint", and is thus enabled to "soften some of the harshest conclusions" at which he had before arrived. The treatise passed through six editions in his lifetime, and in all of them he introduced various additions and corrections. That of 1816 is the last he revised, and supplies the final text from which it has since been reprinted. Notwithstanding the great development which he gave to his work and the almost unprecedented amount of discussion to which it gave rise, it remains a matter of some difficulty to discover what solid contribution he has made to our knowledge, nor is it easy to ascertain precisely what practical precepts, not already familiar, he founded on his theoretic principles. This twofold vagueness is well brought out in his celebrated correspondence with Nassau Senior, in the course of which it seems to be made apparent that his doctrine is new not so much in its essence as in the phraseology in which it is couched. He himself tells us that when, after the publication of the original essay, the main argument of which he had deduced from David Hume, Robert Wallace, Adam Smith and Richard Price, he began to inquire more closely into the subject, he found that "much more had been done" upon it "than he had been aware of." It had "been treated in such a manner by some of the French economists, occasionally by Montesquieu, and, among English writers, by Dr. Franklin, Sir James Steuart, Arthur Young and Rev. J. Townsend, as to create a natural surprise that it had not excited more of the public attention." "Much, however", he thought, "remained yet to be done. The comparison between the increase of population and food had not, perhaps, been stated with sufficient force and precision", and "few inquiries had been made into the various modes by which the level" between population and the means of subsistence "is effected." The first desideratum here mentioned -- the want, namely, of an accurate statement of the relation between the increase of population and food -- Malthus doubtless supposed to have been supplied by the celebrated proposition that "population increases in a geometrical, food in an arithmetical ratio." This proposition, however, has been conclusively shown to be erroneous, there being no such difference of law between the increase of man and that of the organic beings which form his food. When the formula cited is not used, other somewhat nebulous expressions are sometimes employed, as, for example, that "population has a tendency to increase faster than food", a sentence in which both are treated as if they were spontaneous growths, and which, on account of the ambiguity of the word "tendency", is admittedly consistent with the fact asserted by Senior, that food tends to increase faster than population. It must always have been perfectly well known that population will probably (though not necessarily) increase with every augmentation of the supply of subsistence, and may, in some instances, inconveniently press upon, or even for a certain time exceed, the number properly corresponding to that supply. Nor could it ever have been doubted that war, disease, poverty -- the last two often the consequences of vice -- are causes which keep population down. In fact, the way in which abundance, increase of numbers, want, increase of deaths, succeed each other in the natural economy, when reason does not intervene, had been fully explained by Joseph Townsend in his Dissertation on the Poor Laws (1786) which was known to Malthus. Again, it is surely plain enough that the apprehension by individuals of the evils of poverty, or a sense of duty to their possible offspring, may retard the increase of population, and has in all civilized communities operated to a certain extent in that way. It is only when such obvious truths are clothed in the technical terminology of "positive" and "preventive checks" that they appear novel and profound; and yet they appear to contain the whole message of Malthus to mankind. The laborious apparatus of historical and statistical facts respecting the several countries of the globe, adduced in the altered form of the essay, though it contains a good deal that is curious and interesting, establishes no general result which was not previously well known. It would seem, then, that what has been ambitiously called Malthus's theory of population, instead of being a great discovery as some have represented it, or a poisonous novelty, as others have considered it, is no more than a formal enunciation of obvious, though sometimes neglected, facts. The pretentious language often applied to it by economists is objectionable, as being apt to make us forget that the whole subject with which it deals is as yet very imperfectly understood -- the causes which modify the force of the sexual instinct, and those which lead to variations in fecundity, still awaiting a complete investigation. It is the law of diminishing returns from land, involving as it does -- though only hypothetically -- the prospect of a continuously increasing difficulty in obtaining the necessary sustenance for all the members of a society, that gives the principal importance to population as an economic factor. It is, in fact, the confluence of the Malthusian ideas with the theories of David Ricardo, especially with the corollaries which the latter deduced from the doctrine of rent (though these were not accepted by Malthus), that has led to the introduction of population as an element in the discussion of so many economic questions in modern times. Malthus had undoubtedly the great merit of having called public attention in a striking and impressive way to a subject which had neither theoretically nor practically been sufficiently considered. But he and his followers appear to have greatly exaggerated both the magnitude and the urgency of the dangers to which they pointed. In their conceptions a single social imperfection assumed such portentous dimensions that it seemed to overcloud the whole heaven and threaten the world with ruin. This doubtless arose from his having at first omitted altogether from his view of the question the great counteracting agency of moral restraint. Because a force exists, capable, if unchecked, of producing certain results, it does not follow that those results are imminent or even possible in the sphere of experience. A body thrown from the hand would, under the single impulse of projection, move for ever in a straight line; but it would not be reasonable to take special action for the prevention of this result, ignoring the fact that it will be sufficiently counteracted by the other forces which will come into play. And such other forces exist in the case we are considering. If the inherent energy of the principle of population (supposed everywhere the same) is measured by the rate at which numbers increase under the most favorable circumstances, surely the force of less favorable circumstances, acting through prudential or altruistic motives, is measured by the great difference between this maximum rate and those which are observed to prevail in most European countries. Under a rational system of institutions, the adaptation of numbers to the means available for their support is effected by the felt or anticipated pressure of circumstances and the fear of social degradation, within a tolerable degree of approximation to what is desirable. To bring the result nearer to the just standard, a higher measure of popular enlightenment and more serious habits of moral reflection ought indeed to be encouraged. But it is the duty of the individual to his possible offspring, and not any vague notions as to the pressure of the national population on subsistence, that will be adequate to influence conduct. It can scarcely be doubted that the favor which was at once accorded to the views of Malthus in certain circles was due in part to an impression, very welcome to the higher ranks of society, that they tended to relieve the rich and powerful of responsibility for the condition of the working classes, by showing that the latter had chiefly themselves to blame, and not either the negligence of their superiors or the institutions of the country. The application of his doctrines, too, made by some of his successors had the effect of discouraging all active effort for social improvement. Thus Thomas Chalmers "reviews seriatim and gravely sets aside all the schemes usually proposed for the amelioration of the economic condition of the people" on the ground that an increase of comfort will lead to an increase of numbers, and so the last state of things will be worse than the first. Malthus has in more modern times derived a certain degree of reflected lustre from the rise and wide acceptance of the Darwinian hypothesis. Its author himself, in tracing its filiation, points to the phrase "struggle for existence" used by Malthus in relation to the social competition. Darwin believed that man advanced to his present high condition through such a struggle, consequent on his rapid multiplication. He regarded, it is true, the agency of this cause for the improvement of the race as largely superseded by moral influences in the more advanced social stages. Yet he considered it, even in these stages, of so much importance towards that end that, notwithstanding the individual suffering arising from the struggle for life, he deprecated any great reduction in the natural, by which he seems to mean the ordinary, rate of increase. Besides his great work, Malthus wrote Observations on the Effect of the Corn Laws; An Inquiry into the Nature and Progress of Rent; Principles of Political Economy; and Definitions in Political Economy. His views on rent were of real importance.